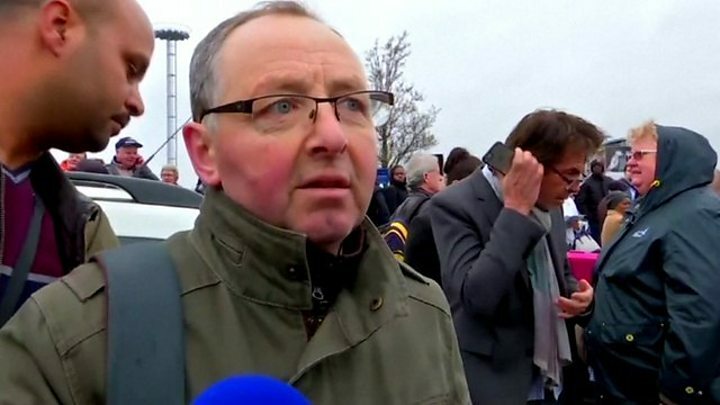 Media caption"The attacker was holding the soldier by her neck"
French security forces have shot dead a gunman as he attacked a patrol at Orly airport south of Paris. Ziyed Ben Belgacem was killed after putting a gun to a female soldier's head saying he wanted to "die by Allah", officials say. Earlier on Saturday the 39-year-old had been involved in a shooting and then a carjacking in the Paris area. Belgacem had been reported as radicalised in the past, and was on a police watch-list. His criminal record included convictions for armed robbery and drugs offences, Paris prosecutor Francois Molins told reporters. He fell under the influence of Islamist radicals was while serving prison time. The attack comes at a sensitive time. France has presidential elections starting next month and remains under a state of emergency. The soldiers at Orly were part of Operation Sentinel - involving thousands of soldiers deployed to provide back-up to the police after the Charlie Hebdo attack in January 2015 and the Paris attacks of November 2015. Early on Saturday morning, Belgacem was stopped at a checkpoint in Garges-les-Gonesse, north of Paris, where he lives. He fired at police with a pellet gun before escaping in a car that was later found abandoned. Police say he then stole a car at gunpoint from a woman at Vitry, south of Paris. That car was later found at Orly airport. Belgacem arrived at the airport and attacked the military patrol in the south terminal. He tried to seize the servicewoman's automatic weapon, put his gun to her head and said: "I'm here to die by Allah. In any case, people are going to die." He was then shot dead by two other soldiers. A copy of the Koran was found on his body, Mr Molins added. Intelligence agents searched his home in Garges-les-Gonesse for evidence of Islamist sympathies, but reportedly found nothing. However, traces of cocaine were discovered during the search. The BBC's Hugh Schofield in Paris says the picture is building up of a man on the criminal fringes of society, who also consorted with Islamist radicals. Orly - located 13km (8 miles) south of Paris - is the capital's second-largest airport. Both the west and the south terminals were closed during the security operation. An estimated 3,000 passengers were evacuated. Many flights were suspended, with some arrivals diverted to Charles de Gaulle airport. But the terminals reopened later in the day and normal flight operations were said to be resuming. Ellie Guttetter, 18, from the US said: "We were sitting in Hall Three when all of a sudden people started running and telling us to run with them. "The people running were passengers and flight attendants. It was pretty chaotic and everyone was panicking - it was scary." Another eyewitness, Meredith Dixon, described seeing panicked airline personnel, with no security or police personnel to usher people outside the airport complex. "It was complete chaos," she told the BBC. "There were no alarms. No overhead announcements. No organised evacuation. People just began running."